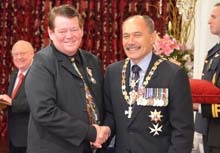 See YouTube clip on a short documentary on the Queens Service Medal Investiture of Alan Watson at Government House Wellington on 22nd May 2015 and the history of the New Zealand Royal Honours. 2015 - The Queens Service Medal (QSM) - In the New Years Honors list it was announced that Alan Watson was a recipient of The Queens Service Medal (QSM) - For services as a magician. Photo: The Governor-General of New Zealand Lt Gen Rt Hon Sir Jerry Mateparae and Alan at Government House in Wellington after the presentation. 2015 - Award of Merit - Academy of Magical Arts - For his tireless work editing and publishing Magic New Zealand, a weekly e-zine distributed to internet subscribers at no charge. Now well past its thousandth issue, it has helped to inform and connect tens of thousands of readers. Photo: Jon Armstrong presented Alan with an Award of Merit at the 47th Academy of Magical Arts Awards in Beverly Hills, USA. 2015 - Presidential Citation - from The Society of American Magicians President - For his extraordinary support promoting the goals and the values of The Society of American Magicians, his constant efforts to elevate and advance the art of magic, for his many years of performing as a professional magician, for his endless dedication and integrity through his newsletter, sharing important magic news and information across the globe. Alan Watson is a great source of pride to all who know him and all would do well to emulate him as he epitomizes out motto: M-U-M, Magic - Unity - Might. J. Marberger Stuart Foundation Inc. in 2002. The DRAGON Award was presented before an audience of more than 1,400 magicians at the 100th year anniversary of the Society of American Magicians in New York. 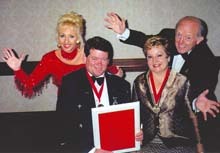 Photo: Paul and Debbie Daniels, the previous years winners presenting Alan and Michele with the DRAGON Award. 2006 - The Benny - Lifetime achievement - The most prestigious and highest Award of The New Zealand Variety Artists Club Inc.
2006 - Life Member - New Zealand Variety Artists Club Inc.
2017 - Life Member - BAM - Brotherhood of Auckland Magicians Inc.
1981 - Life Member - NZSM - New Zealand Society of Magicians Inc.
Dear Alan We at Rainbows End would like to thank you for your performances over the Christmas holiday season. Your show was well received and always consistent of genuine entertainment. Feedback showed that your show was appreciated, by both children and parents, as only positive feedback was given.